Put the leek, ginger and chives into a processor and blitz until finely chopped. Transfer to a bowl. Blitz the salmon till finely chopped and add to the bowl. Stir in the remaining salmon cake ingredients, season and form the mix into 16 cakes; if time allows, chill the cakes for 30 minutes. 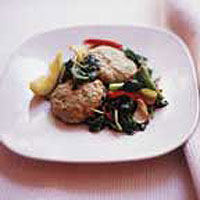 Steam the salmon cakes, in batches, for 4-5 minutes or until cooked through. Heat the groundnut oil in a wok over a high heat. Add the garlic, ginger and lemon grass. Stir-fry for a minute, then add the chillies, salads onion and pepper. Cook for another minute. Add the spinach and watercress, stir well, then add the lemon juice and soy sauce. Season and serve immediately with the salmon cakes.